I know very few people who still watch television. Television is boring, pointless and hopelessly outdated. For some reason millions of people still watch it, but it’s a matter of time until the whole industry will crumble like the governments of the USSR and Libya did, and we shall wonder why did it take so long. It will be painful to some people who make their living from it, but it will happen. The future of entertainment and broadcasting is shaping now, and the direction is not bad. With each version of the modern web browsers – Firefox, Chrome and Opera – embedding video into pages is getting easier and works better. Users are forced less and less to install proprietary and unstable plugins. Flash is becoming a thing of the past, with YouTube working without it just as well. Diverse people create excellent music and films in their homes and they are able to publish it instantly. Business models for getting people to pay for DRM-free video and music are improving, too, for everybody’s benefit. For some reason, however, Google and Microsoft aren’t happy about these perfectly sensible developments. They are proposing to add DRM – Digital Restriction Management – to the HTML standard. This weird document says that “No ‘DRM’ is added to the HTML5 specification“, but a document that speaks about encrypting and “protecting” content is a document about DRM. This is not “protection”, but restriction, and it is defective by design. Preventing the copying of music and video files is not actually important to Google or to the media production companies. They will find ways to charge money for music and video. They rather want to know who is listening to what, to know what to produce and to whom to sell it. Google is essentially an advertising company, and an advertising company’s biggest asset is demographic data about people’s tastes and customs. This is a grave privacy concern, of course, but there are enough privacy geeks to write about that. I’m not much of a privacy geek; what i really care about for this matter is the future of culture. Culture has to be interesting, vibrant and constantly innovative. When advertisers and media providers know the tastes of the “consumers” too well, culture tends to repeat itself and become very bad. Much like television in the last few years. It is highly unlikely that the W3C will accept this proposal and make it standard. W3C dislikes DRM to begin with, Mozilla representatives in the W3C will definitely oppose to it, and even Google’s own W3C representative isn’t enthusiastic about it. Nevertheless, it’s easy to imagine that Google will implement this proposal in Chrome, and Microsoft will implement it in Internet Explorer. Then they will set up several websites with “partners” who will provide “content” that cannot be played without this DRM scheme, and this will pull more people into using these browsers and lock them into a nightmare of pointless, recycled, creativity-stifling entertainment. I am a Mozillian. You may think that this means that i want Firefox’s market share to be 100%. That is not what i want. I love the web and i want it to be great for all people, no matter which browser they use. Building Digital Restriction Management into browsers will make the web, and the whole culture around it, bad and boring. Don’t let that happen to the web. If you care about culture and arts, use Firefox – a browser that is committed to openness and not to advertising revenue. 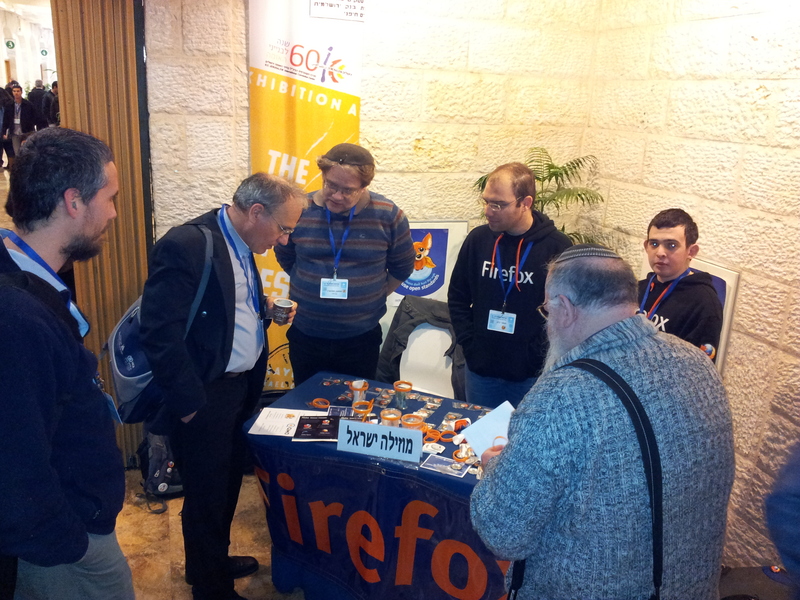 On Tuesday i attended the Israel Internet Society Conference 2012. Standing like that and telling person after person that Mozilla is not a commercial company and that it’s concerned with far more important things than Firefox’s market share is very satisfying and sobering. 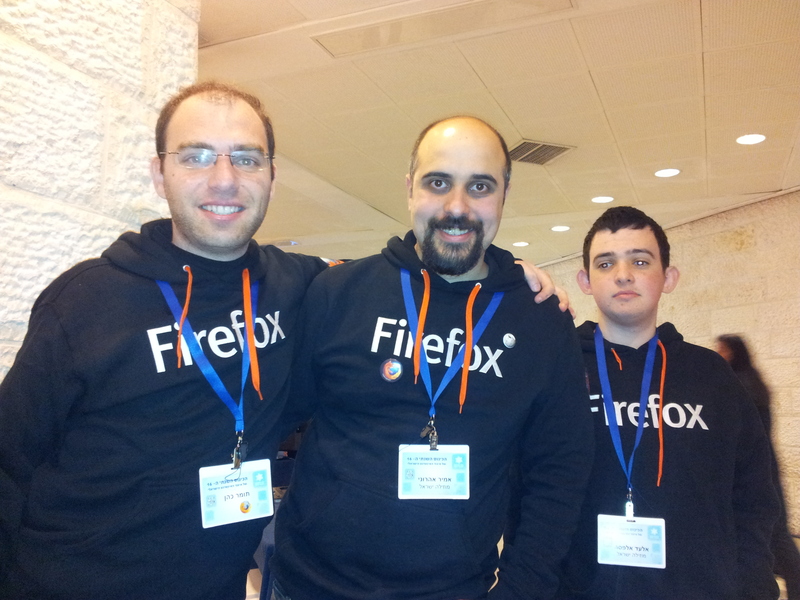 Right-to-left: Elad Alfassa, Amir Aharoni, Tomer Cohen. Mozilla Israel is an open community, which is friendly to other open projects, so in addition to Mozilla Firefox swag, Elad gave out Fedora CDs and i gave out Wikipedia stickers. We tried to give special attention to Mozilla’s mobile projects – first and foremost, the rewritten version of the mobile Firefox for Android, which is not yet complete, but getting there; we also got some people to install a preview version (Aurora) of the mobile browser. I’m happy to see that there are quite a lot of open-minded people who are willing to try another interesting browser, even though it’s not completely polished it and even though the default kinda works. 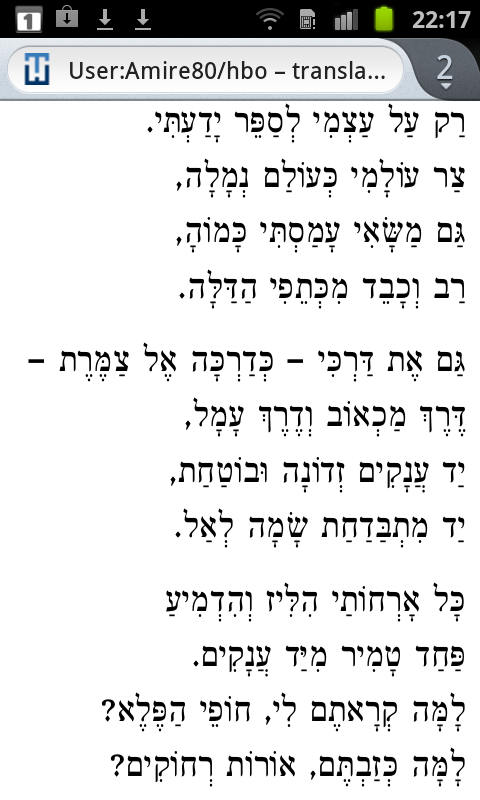 Some people who expressed interest in education were very also impressed when i showed them that the Mobile Firefox, though still not being release-quality, is able to render Hebrew poetry very well – something that the built-in Webkit browser is not able to do. The famous poem "Only About Myself" by Rachel, rendered correctly in Mobile Firefox. The same poem, rendered incorrectly by the Mobile Webkit browser. That's the one that's just called "Browser" or "Internet" on your phone. 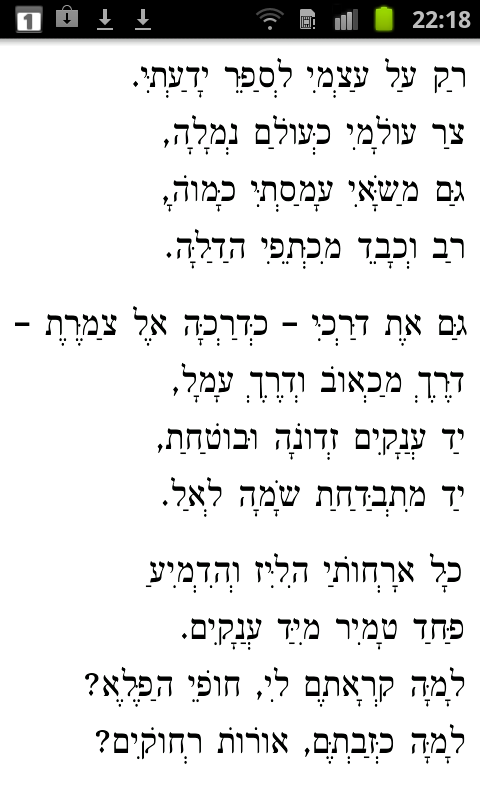 You see, you usually don’t need correct rendering of the special characters needed to display Hebrew poetry if you only use the web to write email and read news, but if you are a school student who wants to prepare the homework or a commuter who likes to read poetry on a train, you’ll be able to do it with Firefox, but not with Webkit (the Opera browser is broken in this regard, too). This is more than a small and unimportant feature that happens to work correctly; this is a demonstration of the fact that Mozilla developers think that it’s important to support all languages, all scripts and all standards – for all people. Firefox Home, the app for synchronizing desktop Firefox with iPhone, was a hit, too, and a few people installed it on their iPhones right at the booth. This was a very satisfying day. Do you believe in Mozilla’s goal of open web, based on open standards and open to all people? Become a Mozilla Rep! 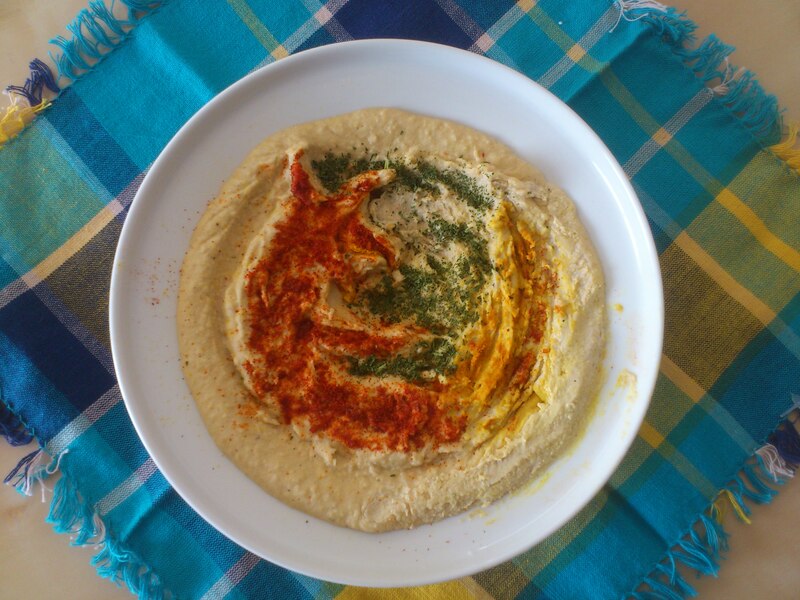 I made this hummus, and my wife seasoned it in the shape of the Mozilla Firefox logo. I’d like to use this opportunity to remind that Mozilla is not just a good web browser with a cute logo, but also a non-profit community of people who love the web and who work to keep the web free, open, standard and accessible to all.